Cisco's new offices in Toronto, Canada have been installed with the very latest in Smart technology. Employees can control their personal office space's temperature, lighting, and energy features with just an app on their phone. Known as 'personal occupancy control', this is sure to be a common feature of offices of the future. 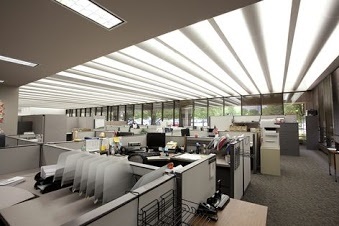 A British study found that ?the option for control over lighting in individual workspace may account for higher occupant satisfaction than actual differences in luminance.? In another study conducted for Herman Miller, Harris Interactive found that ?temperature, natural light, and privacy?the items defined as critical to productivity?were also the items all wanted more control over.? Researchers said that the most favourable responses were given to things that allow users to control their personal space temperature, lighting, decorating, and advance seating adjustments. As an office fit out contractor specialising in small to medium sized office fit-outs, we're not typically dealing with the budgets of the likes of Cisco, but there is certainly that desire from clients to find ways to improve employee well-being and performance and increasingly we're working with clients to put in place affordable solutions. By using lighting controls such as presence detection, daylight controls and sunlight harvesting, companies can achieve immediate savings and better efficiencies that will have a positive knock-on effect on the bottom line. It's possible to provide a healthy and happy working environment for everyone and you don't need a huge office fit out budget to achieve it. Talk to us to find out how we can inject some harmony into your workplace.